Those who have explored various fly fishing destinations in Montanaknow that it takes a certain degree of technique, patience, and knowledge to catch a beautiful fish in one of the state’s many beautiful rivers. If you have invested in a fly fishing vacation package and have questions about perfecting your fishing technique, then don’t hesitate to consult with one of the professionals in our lodge. Here are some of our essential fly fishing tips. If you are finding it a challenge to determine which color to use when purchasing or creating fly fishing flies, then draw inspiration from the season. Darker flies should be used during late fall and continuing into winter and early spring. Once summer arrives, you should switch to a lighter fly. Another essential fishing tip to consider is that the fly you use will be influenced heavily by the type of water you fish. For example, Madison river fishing or Beaverhead river fishing strategies will differ vastly from those used in salt water fishing. In fresh water, be patient, use a drag-free cast, and try to remain low in height when casting from the peripheral of the fish’s position so avoid detection. In addition to matching the color of a fish’s natural food selection, you need to ensure that your flies mimic the behavior of that species’ prey. Fish will grow instantly suspicious of a food source that does not fall in the part of the water column they are used to finding it in. Be sure that you use an emerger, dry fly, nymph, or streamer accordingly. It is crucial to remember that you may not be the only person fly fishing in a given river. As a rule of thumb, try to always remain at least 100 yards away from a fellow fly fisherman when fishing in a major river. 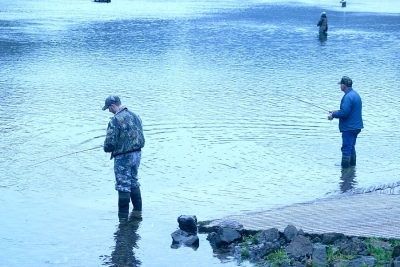 For information on each specific river’s standards, consult with someone at the local fishing lodge.